Effective metal bonding adhesives are offered to bond most metals including aluminum, steel, stainless steel, and galvanized steel. Each industrial adhesive bonder has capacity to be used in glass, metal, plastic, medical, and others. Saimax metal bonding adhesive system is primer-less, high performance and approved by major automotive companies for vehicle repair and assembly. 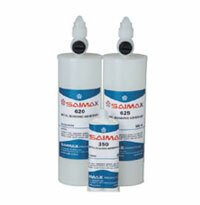 These adhesives cure fast, extremely cost effective, performance proven and are easy to use. Metal bonder is also suitable for spot bonding of copper plates or aluminum. It is an instant adhesive that acts quickly and provide desired results for which the industry chases for its qualitative and quantitative uses. Super fast cure- designed for smaller panels bonding in a short time. De-clamp time in 15 to 20 minutes. 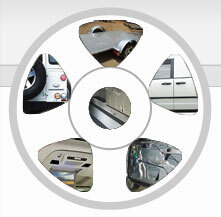 Surfaces: Designed to bond wide variety of bare metals including aluminum. Applications:Patch1 panel bonding and bonding of dissimilar metals, panel sections, cab corners and aluminum trailer repair patch1es. Fast de-clamp time for smaller panel bonding. Medium cure speed-ideal for large to medium size assembly. De-clamp time in 1-1/2 to 2 hours. Applications: All purpose adhesive with long working time. Excellent adhesion to wide variety of metal and plastic surfaces. Panel bonding and weld bonding of quarter panels, rear body panels, door skins, roof panels, outer truck bed panels, van side panels, etc. Ideal for hot temperature conditions. Long open time for large panel bonding. Applications: Panel bonding and weld bonding of quarter panels, rear body panels, roof panels, door skins, van side panels and outer truck bed panels. Long open time designed for large panel replacement.